The typical Christmas tradition of searching for and finding a family Christmas tree, cutting it down and bring it home to decorate is alive and well on River Road in Windham. The pungent tang of the trimmed trees hangs in the crisp air at Merry Christmas Trees farm, while families search for the perfect tree, bow saw in hand. This family business has been planting and cutting trees at 105 River Road since 1989. Now under the ownership of Doug Fortier, whose full time job is as the director of public works in Windham, the trees are trimmed and ready to become a part of a special holiday celebration. “I have farming in my blood,” said Fortier, who is a fifth generation farmer, though it hasn’t always been trees his family has farmed. When he works the farm it’s different from his day job. “I can do my own thing,” he said. “I can disappear into my head.” The quiet in the field is only disturbed by a chirping bird. Merry Christmas Trees only sells balsam fir trees, which are the traditional Christmas trees. He works them year round to make sure they are the fullest and best trees around. The cutting will begin the day after Thanksgiving. Cutting the trees is easy. The employees, usually Fortier or his brother-in-law or sister tell you in which field the trees are being cut, they give the person or family a bow saw and some bailing twine to wrap up the tree for transportation. The tree is paid for and off it goes. When a fresh tree is cut put it in a bucket of water because it will drink a quart of water each day. At the beginning trees might need to be watered two or three times a day, Fortier said. The trees are $45 no matter the size and won’t drop needles like trees that have been cut for a long time. One of the misconceptions about real trees is that they will dry out quickly and can cause a fire, but Fortier said that was not the case with a fresh cut tree. As long as they are watered consistently, they will not drop many needles and the fire risk is very low, especially with today’s LED lights. Some places that sell trees have them shipped in, which means that they have been sitting out of water for sometimes a month or more. If that is the case, then trim a quarter-of-an-inch from the bottom and water it, but watch it closely. “You get what you pay for,” he said. The trees being cut this year at Merry Christmas Trees are near the back of the property and are seven to eight years old. “In tree farming, patience is a virtue,” Fortier said. Some of the best memories Fortier has are of families who return from the field with their tree and tell him how beautiful it is or how they had such a great time. Or he can hear the kids in the fields laughing and having fun. “That is a reward that most farmers don’t get. I grow trees, I don’t grow food,” Fortier said. He doesn’t get the comments about how delicious the fresh produce was, he looks for the smiles on people’s faces. Christmas trees need care year round. Fortier and his friend Tony Beaulieu, an engineer from Lewiston, have been working together for 13 years. “There’s been quite a progression with the trees,” said Fortier. “It’s cool coming year to year and seeing the changes. The trees are well maintained and very clean,” Beaulieu added. In the spring Fortier brings in a crew of family and friends to plant seedlings. This year it was 1,700 planted in under three hours. “There is a lot of work, seven to eight years to have a tree,” said Fortier. Two feet trees are hand snipped and each year something is done to each tree. “That’s how you get those trees,” he said. Each tree is trimmed the way it makes the most sense. Some trees are skinny and tall, and some trees are fat and short. “Trees are like people, some grow quick and some grow slow,” he added. The farm is open from the day after Thanksgiving to Christmas Eve, unless they run out of allotted trees for the year. For those thinking of getting into tree farming, some advice form Fortier. “If they are willing to work hard, not have a lot of free time and a willing to wait seven or eight years for a return, tree farming could be for them,” he said with a smile. 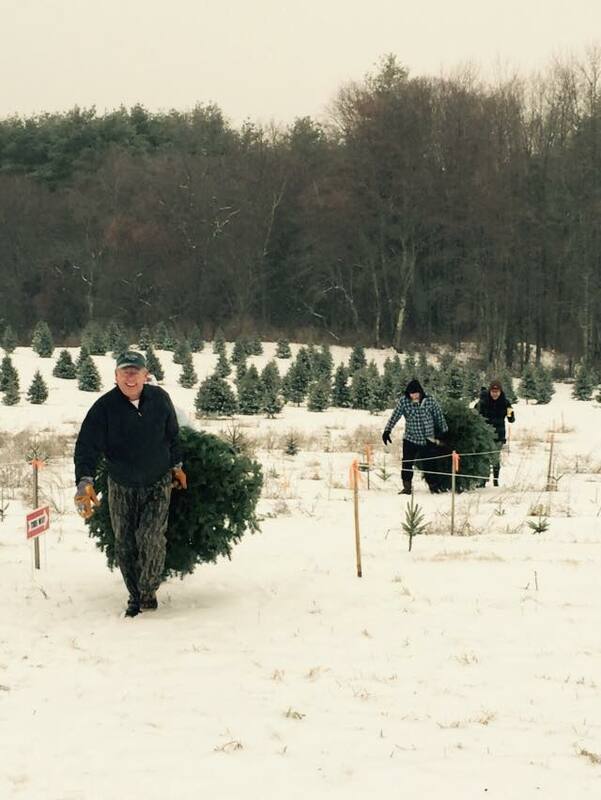 Merry Christmas Trees is part of the Maine Christmas Tree Association. For more or to see pictures of happy customers, visit Merry Christmas Trees on Facebook or call them at 318-2012.